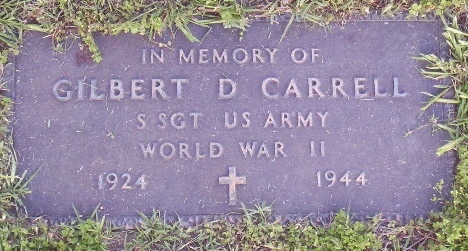 Gilbert D. Carrell, the son of Albert and Myrtle Carrell, was born in Wichita, Kansas in 1924. He attended Wichita North High School where he was a standout baseball, basketball and football player. He went on to play semi-pro baseball in Wichita before entering military service. Carrell was assigned to Company F, 262nd Infantry Regiment of the 66th “Black Panther” Infantry Division, and sailed for England on November 15, 1944. Eleven days later the division arrived at Southampton and was billeted in barracks and towns around Dorchester in the southwest part of the country. The next month was spent preparing for combat in Europe. On Christmas Eve 1944, Staff Sergeant Carrell was among 2,235 troops of the 262nd and 264th Infantry Regiments that boarded the SS Leopoldville - a Belgian passenger ship converted into a transport - that left England bound for the port of Cherbourg in France. 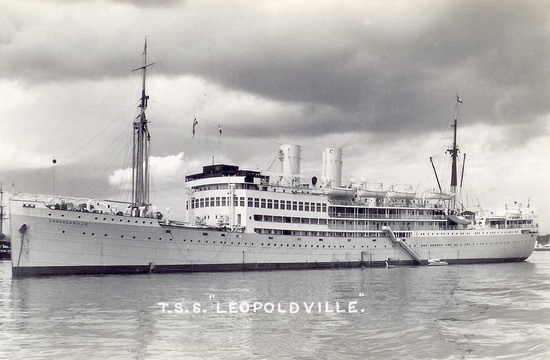 Just five miles from the French coast, the Leopoldville was spotted by German U-boat U-486. At around 5:55 P.M., a torpedo that was launched by the submarine ripped a gaping hole below the water line of the Leopoldville, exactly where Carell and Company F was quartered. The Leopoldville sank hours later and approximately 515 troops went down with the ship. Only 19 of 175 troops assigned to the company survived. Another 248 died from injuries, drowning or hypothermia (Howard DeMartini, who had won 33 games during 1940 and 1941 while pitching in the Giants’ farm system, and Link Berry, who had won 47 games with New Bern of the Coastal Plain League between 1939 and 1941, also died that night. Harvey Riebe, who had caught 11 games for the Detroit Tigers in 1942, spent 45 minutes in the icy water before he was rescued). The German U-boat U-486 was torpedoed and sunk by the British submarine HMS Tapir on April 12, 1945. The sinking of the Leopoldville and the tragic loss of life was embarrassment to the American and British governments and kept secret for many years. Even the families who lost loved ones that night were never told the truth and documents related to the sinking were not declassified until 1996. Although Carrell’s family was informed of his death in January 1945, it was reported as a plane crash. Also aboard the Leopoldville was Harvey Riebe, who had caught 11 games for the Detroit Tigers in 1942. Riebe spent 45 minutes in the icy waters before being fished out by an English boat. The body of Gilbert Carrell was never found. He is remembered at the Tablets of the Missing at Normandy American Cemetery in Colleville-sur-Mer, France. He is also remembered at White Chapel Memorial Gardens in Wichita.